The issues with Hangouts on Android are becoming legendary at this point. It's an app that has suffered from a multitude of bugs, sluggishness issues, and incomplete features over the years. Now, a rumor posted by Phandroid says that Google is going to pull one of the more problematic (and important) features from Hangouts in a future update—SMS and MMS. 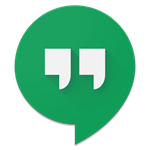 Google added text messaging with much fanfare back in 2013 as part of Hangouts v2.0. However, it was super janky and confusing. It wasn't until 2014 that merged conversations and manual selection between Google Voice and standard SMS were added. Through it all, the Hangouts app has had issues related to text messages and other features, and somehow no one has gotten around to making a tablet UI... except on iOS. But I digress, the rumor now is that Hangouts will drop text message support for carrier numbers. However, Google Voice and Fi will continue to work in Hangouts. In the internal Google build, Phandroid says users are directed to download Google's Messenger app for text messaging. In fairness, Messenger is a pretty great app. If this does happen, you have to wonder why Google would scrap a feature that it worked so long to get right. It's possible that it takes too much time to maintain SMS in Hangouts, and developers would do better to spend their time on other things. Or maybe Google has something big in the works, and this is just the first step. Hopefully we'll know more when and if this happens. On the plus side, quick reply might finally be happening at some point soon (maybe).